Photo No. 205: I recently encountered this photo of Doughboys in training, one of whom may be wearing a pair of Specification No. 1352 Victory Marching Shoes* with a smooth hobnail-less sole and a toe cap. Enlargements of the soldier’s shoes and the only image of the 1352 specification shoe I have are shown on the right for comparison. *For more information on the Victory marching Shoe see post number 87, on page 5 of this post. Photo No. 206: Close up of the left shoe in which the convex curve on the front of the quarter, and what appears to be a toe cap are visible. Forum member Hawkdriver was kind enough to photograph the 1919 Occupation Shoes from his collection for me to add to this post. Photo No. 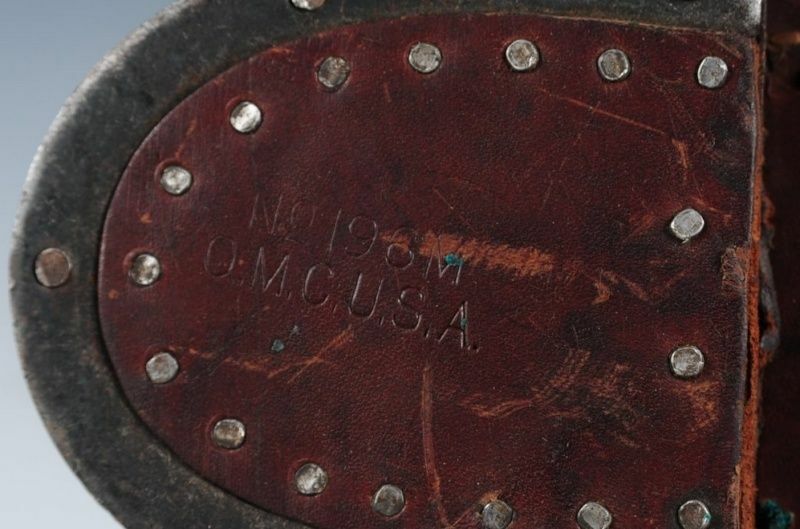 207: Another pair of 1919 Metallic Fastened, Field Shoes, Specification No. 412-2-1351, adopted on May 10, 1919. This shoe replaced the 1918 Pershing Field Shoe which was considered to be too heavy for ordinary field service in the post WW I Army. The profile shows the wider counter pocket which was reinforced with four split rivets on each side. 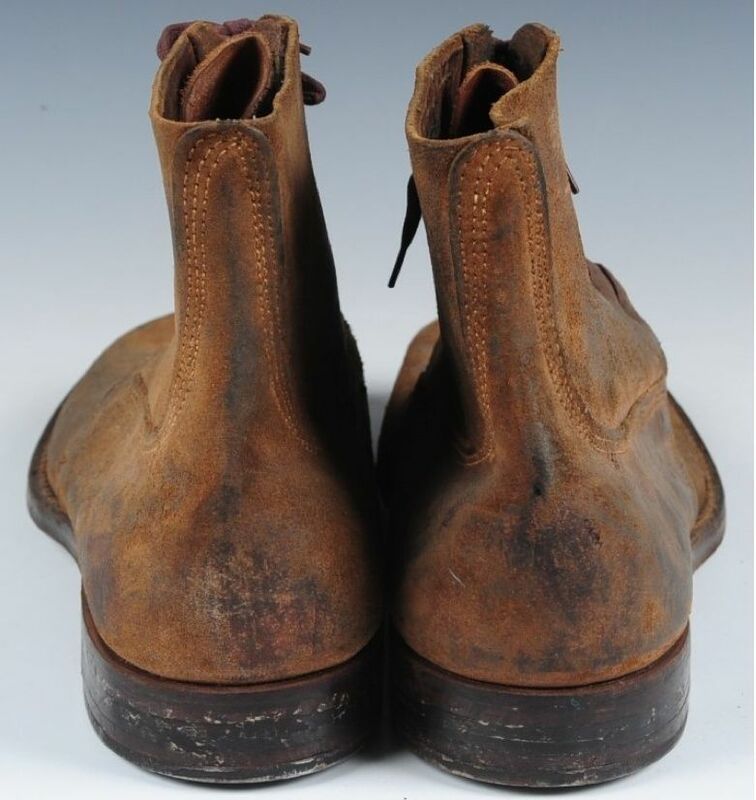 The two heavy leather soles and the "outside Tap" or half sole that replaced the Pershing Shoe's third outer sole. The bottom of the shoe displays the outside tap studded with well worn, late pattern star headed or corrugated hobnails. 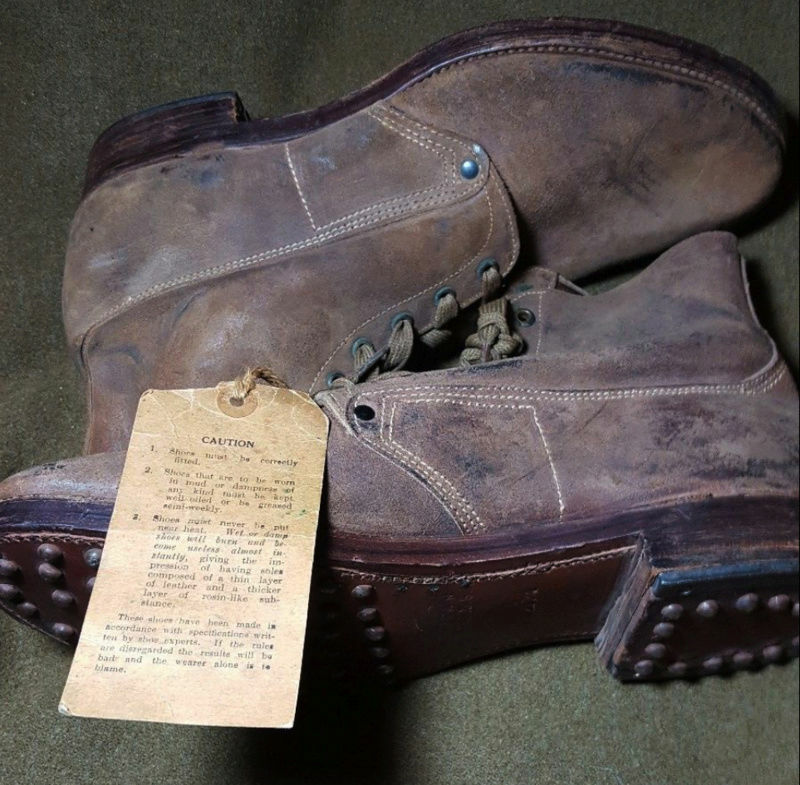 Although difficult to see in the photo, the front of the shoe is protected by the same casehardened steel toe plate that was used on the Pershing Field Shoe. Photo No. 208: Front of the Occupation Field Shoe in which the steel top plate can just be made out. The inset shows the brass rivet used to reinforce the vulnerable joint where the quarters meet the vamp. 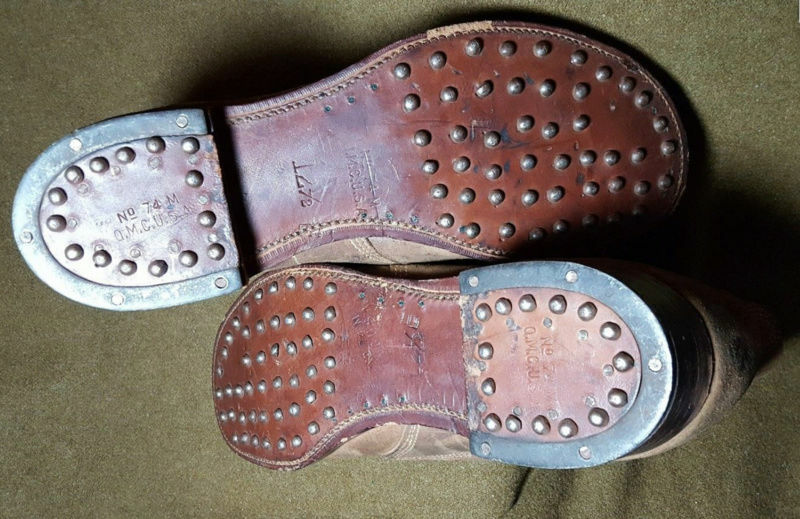 At left is a close up of the split rivets used to reinforced the counter pocket, and an enlarged view of the shoe’s heel showing the steel heel plate and the corrugated hobnails which have been worn smooth. Photo No. 209: Unless you have a pair in hand, this photograph from the Library of Congress is about as close as any one of us will likely get to a pair of absolutely mint, unissued pair of 1917 'Trench' Shoes. Likely taken in the summer of 1917, the photo shows what is probably a pair of first pattern Specification No. 1257 Field Shoes. Photo No. 210: This photo, also from the Library of Congress, compares the new 1917 Field Shoe to the U.S. Army shoe it replaced, the 1912 Russet Leather Marching Shoe. Photo No. 211: This photograph, which was posted elsewhere on the forum, shows signalmen of the 3rd Division mimicking the operation of a signal lamp. The far right Doughboy appears to be wearing either a pair of 1917 French Brodequins or a pair of American made field shoes that have been resoled and re-heeled by the Salvage Service. Photo No. 212: Close up of the Doughboy and the bottom of his shoe, showing the French style heel which is hobnailed with large square hobnails. Very interesting shoes. 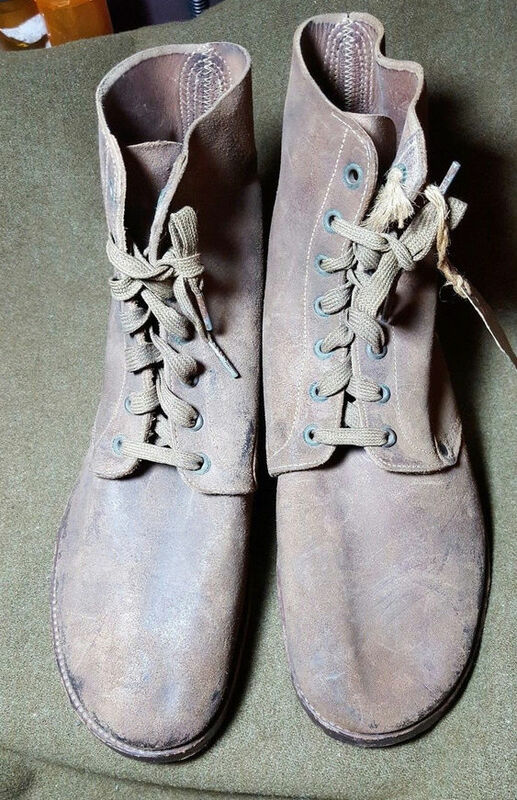 They look like 1917 Trench Shoes, but they have three rows of stitching, rather than two on the backstay like a pair of 1918 Pershing Shoes. They also appear to have the thicker steel heel plate that was also used on the Pershing Shoe. 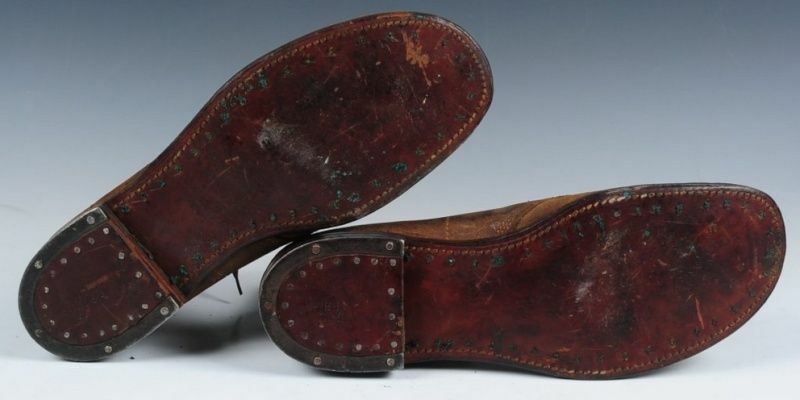 All of the above, plus the fact that the size has been permanently cut into the inside of the upper indicates that they were manufactured after the Pershing Shoe had been adopted. Photo No. 213: Because this particular pair of Specification No. 1309 Pershing Shoes recently sold at the Glen ‘Corky’ Reed estate auction were in such great condition, I thought would be a worthy addition to this thread. Their dark uniform color indicates that they were waterproofed ‘dubbined’ during the manufacturing process at the factory. 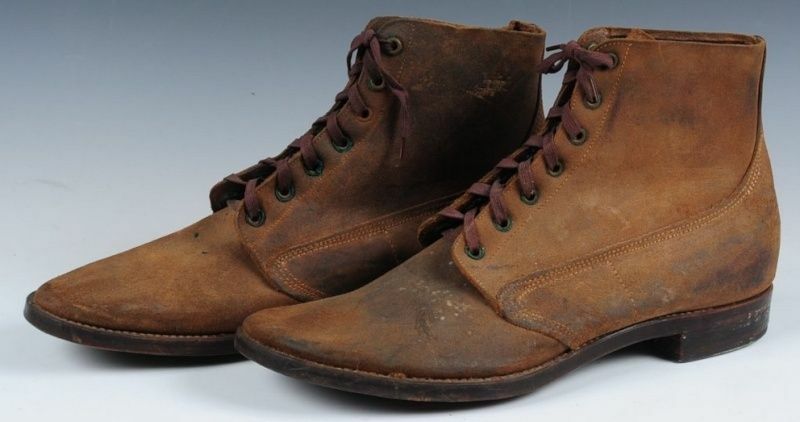 At some point before the war ended, this practice was discontinued because GHQ felt that the dark brown hue made the shoe, and the men who wore them, appear soiled and un-soldierly. 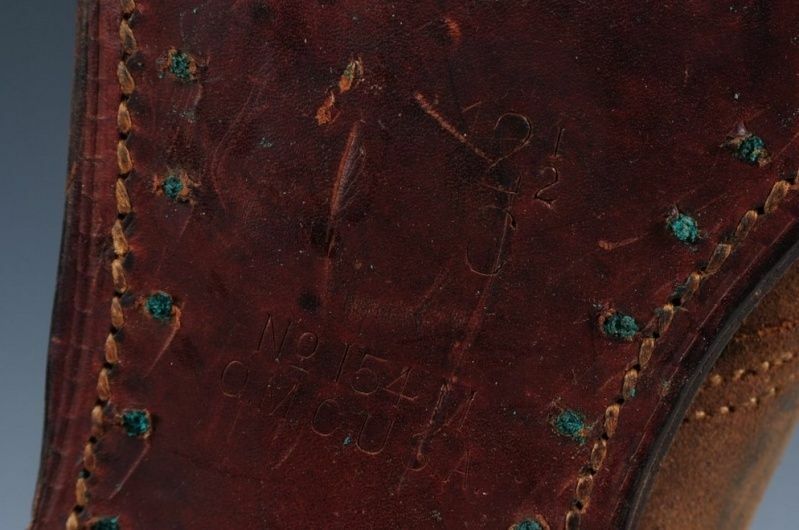 The inset shows the separate size and Quartermaster inspector stamps found on the shank of the shoes sole. Photo No. 214: Although this is the third pair of Pershing shoes that have turned up with a rivet reinforced heel counter, there is nothing in any of the field shoe specifications which called out for this to be done. Aside from the six round rivets securing the heel counter onto the backstay, this particular pair of Pershing Shoes is a textbook example of a factory waterproofed field shoe. Photo No. 215: Clockwise from lower left, detail of the front and bottom of the steel toe plate, close up of the Quartermaster inspector stamp on the shoe’s heel, and the steel heel plate and single row of hobnails on the inner heel. Personally, I've always liked all of the little things like your receipt for the shoes that are found in Doughboy uniform pockets, ditty bags, etc. 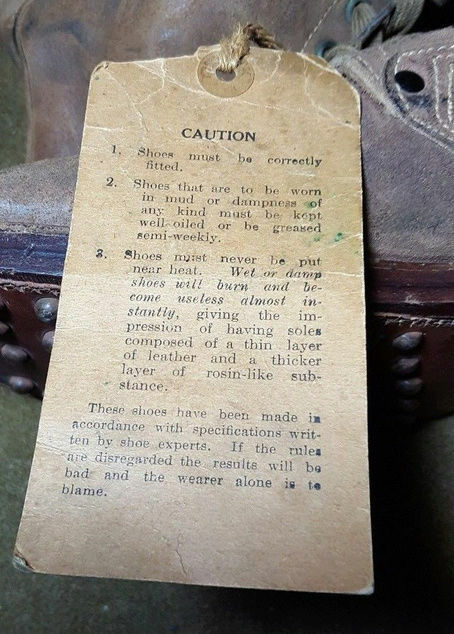 To everyone else, please feel free to post other WW I era related shoe and foot related items - foot powder, shoe polish, spare shoe laces, etc. All of that stuff helps to make the story of the polished russet and rough side out field shoes more complete. A fellow minutiae enthusiast! Love it! Perhaps we should call you "The Boot Scientist" from now on? Thanks so much for this invaluable resource. It truly is amazing. I can't tell you how many times I've read through it (and even/actually used the information). Really, thanks for all the time and effort you put into this and for sharing it with us. Olivier, Thanks for adding the photos. What a great shot of the tag with the instructions for caring for the shoes. Two-part advertisement from a 1922 QM auction of surplus trench shoes. Includes details about the four specifications or Pershing and two specifications of Victory shoes which were in stateside inventory after the war. ccranger, great additions ... Thanks!